What is the display ID plz ? A viable upgrade for a Death Knight around that level, as the strength ties in perfectly for tanking ability, as well as the high Stamina on this. It also hits like a truck, which is always nice. I see these in auction houses on Windrunner for as low as 60g, so it's worth checking out if you're in need of a nice upgrade. Also remember that Mace Specialization for Humans/Dwarfs gives this weapon a +3/+5 Expertise as well. Not just expertise rating, but pure expertise. I had this massive mace drop off of a Drakuru Raptor Rider while hunting down the Heavy Frostweave Bandage Manual. Didn't realize how lucky I was until i read up on it. Like previously stated, a GREAT tanking weapon, not bad on the eyes either. 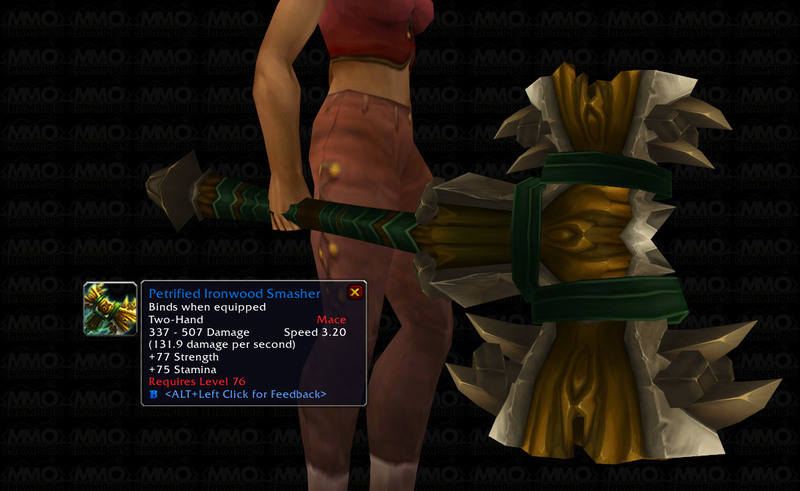 Do you have to have a mace specialization to use them as a DK? I have an undead blood DK and I can only use swords, axes, and polearms. Picked this up with Mongoose for my Paladin's Ret spec. Works quite well. Looks great and crits like a Mack truck. Dropped for me while grinding the Venture Co. Mobs in Sholazar. A solid weapon (pun intended) for DK tanks and also for ret pallies. At this point I am specced prot, so I am going to hold onto this for now. I can make the Saronite Mindcrusher in 3 levels, so I might just put this on the AH and make myself a pretty penny. The only problem I have with alot of the NR weapons is that they look like they were made by 5 year olds. Look at this...it is basically a few pieces of wood strung together. EDIT: One thing to note about this weapon is it is fairly fast, which is definitely a downer. In my search for giant hammers, for transmogrification, I came across this bad boy. for the love of scantily clad berzerker warrior babes! I got this from a sturdy treasure chest.